"Find and destroy the source of the Vex surging to protect the Black Garden." A Rising Tide is a story mission that takes place in the Buried City on Mars. Ghost: The Vex are taking control of the surface to protect the Black Garden. Mars could soon be worse than Venus We've got to find out where they're coming from. Ghost: We need to track down a Conflux, like we saw on Venus. There's reports of one not too far from here. The Guardian travels to the Scablands, where a conflux can be seen in the distance. Ghost: Once we find out where the Vex are coming from, cut them off—or it's only a matter of time before Mars becomes one of their machines. There's the conflux! A Vex spawn cloud darkens the environment before several Goblins and a Minotaur appear. The Guardian kills them and sends the Ghost to investigate. Ghost: This is part of an even bigger surge, coming from below the Buried City. We'd better check it out. The Guardian makes their way to the Buried City and enters the abandoned subway. The entire area is pitch black, save for the Ghost's flashlight. Ghost: Looks like it's going to be dark in here for a while. Just aim for any red eye you see. Dozens of Goblins and Hobgoblins spawn in the darkness, leaving the Guardian to fend for themselves as they make their way through. They eventually come across a large open area, still lit. Inside, more Vex, including a Cyclops, guard the subway tunnels. The Guardian kills them all and continues further down. 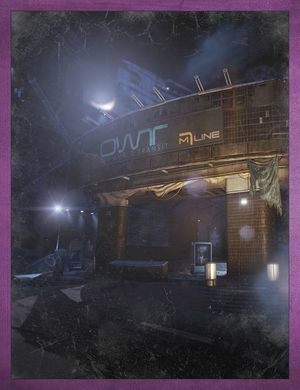 Ghost: It's like the Vex have dormant networks buried under every planet... waiting to be revived. The Guardian walks through the Freehold station, eventually reaching the Tharsis Junction, the Vex spawning ground. Ghost: They have Transfer Gates here—shut them down! The Guardian finds a Transfer Gate and destroys it, along with the surrounding Vex. Ghost: More gates up ahead! The Guardian comes across several transfer gates, Vex pouring out of them by the second. The Guardian destroys the gates, annihilates the Vex, and kills their leader, the Prohibitive Mind. Ghost: That should slow them down! The Guardian and Ghost notice a conflux in the middle of the area. Ghost: A Conflux is still active... let me check it out. The Guardian does so, as the Ghost explores. Ghost: This isn't an invasion; the Vex are returning home. Something is calling them back to the Black Garden.